Whiteflies attach their eggs to plants by implanting the egg pedicel into the epidermis of the underside of leaves. 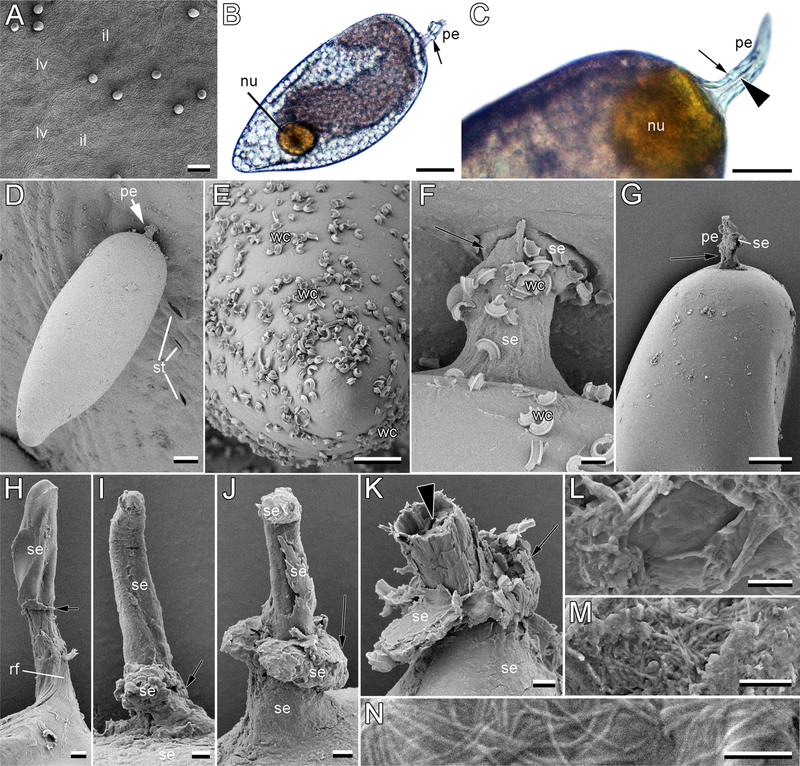 This pedicel works like a wall plug embedded in sealing cement, presenting a smart interconnection, which was exemplarily studied in Trialeurodes vaporariorum eggs on two stages of abaxial leaflets of four cut rose cultivars using a combination of microscopic and biomechanical techniques. The penetration force obtained by piercing single epidermal cells with an insect minuten pin did not significantly correlate with the force which was applied to pull off the greenhouse whitefly eggs from abaxial leaves. A maximum pull-off force of 5.4 mN was measured on young leaves of the rose cultivar ‘Schloss Ippenburg®’, corresponding to maximum 941 times the egg weight. Egg pull-off force significantly differed between cut rose cultivars and leaf ages. On greenhouse whitefly-susceptible cultivars ‘Poesie®’ and ‘Reggae®’, eggs detached, applying less force compared to that on resistant cultivars. Leaf structural features had no significant impact on greenhouse whitefly egg pull-off forces. A major effect of leaf turgor pressure and swelling of colleterial gland secretion (cement) surrounding the whitefly egg is assumed to facilitate the firm interconnection between egg and plant epidermis by a combination of form closure, friction locking, and adhesive bond forming a composite material in the contact region. This bond exhibits a maximum adhesive strength of 12.2 MPa, which is much higher than those in beetle and moth eggs glued to oviposition substrates. The online version of this article ( https://doi.org/10.1007/s11829-019-09680-5) contains supplementary material, which is available to authorized users. Egg attachment to plants is a key feature in arthropod-plant evolution related to the establishment of arthropod populations on plants. Placing the eggs firmly on suitable substrates maximizes offspring, survival, and performance. Thus, female oviposition behavior must be an important component of arthropod fitness on which selection may act (Jaenike 1978; van Lenteren and Noldus 1990; Hilker 1994; Walker and Perring 1994; Janz 2002; Hilker and Meiners 2006; Darshanee et al. 2017). Knowing about the repellent properties of plant surfaces (e.g., Knoll 1914; Stork 1980, 1986; Eigenbrode 1996, 2004), arthropods overcome substantial hurdles while clinging to, walking, feeding and ovipositing on plants (Southwood 1986). One strategy is gluing eggs by glandular secretions which can adhere strongly, corresponding to a multifold of egg weight. For example, Asparagus beetle Crioceris asparagi L. (Coleoptera, Chrysomelidae) eggs hold up to 271 kPa on hydrophobic, crystalline waxy cladophylls of Asparagus officinalis L. (Asparagaceae), which is comparable to 20,588 times the weight of one egg (Voigt and Gorb 2010). Another strategy is the implantation of eggs or part of eggs into living plant tissue supplying humidity, protecting from unsuitable weathering and animal enemies, which meets certain parental care and the assumedly primary mode of insect oviposition (Strümpel 1983). The ingenious egg coupling to plant tissue via a pedicel (hydropyle) with a strongly derived, piercing-sawing, actively penetrating, and forcibly inserting ovipositor is one of the synapomorphies which share representatives of Psylloidea with those of Aleyrodoidea (Hemiptera, Sternorrhyncha, Psylliformes) (Quaintance and Baker 1915; Strümpel 1983; Bährmann 2002; Grimaldi and Engel 2005; Emeljanov 2014). The length of egg pedicel varies greatly with different whitefly species (Quaintance and Baker 1915). We wondered about the firmness of the egg pedicel-plant tissue bonds and chose the greenhouse whitefly Trialeurodes vaporariorum Westwood (Hemiptera, Aleyrodidae) as a model species for morphological and biomechanical studies. Its egg properties and oviposition have been thoroughly studied during the past century. However, egg attachment on different plant substrates is not mechanically quantified so far. The irregularly or circularly dispersed eggs of T. vaporariorum on leaf veins and the lamina appear to be elongated, irregular ellipsoids with an apically tapered and a basally flattened pole. Their dorsal side is more prominently curved than the ventral side, with a somewhat eccentrically positioned, dorsally shifted hollow stem (pedicel), which is a protuberance of the chorion (Lloyd 1922; Weber 1931; Byrne et al. 1990; Gill 1990; Lauritsen and Paulson 1998). The egg pedicel base diameter resembles the wall thickness of the egg chorion and terminates in a thin-walled, bulbous distal end with a highly porous surface covered with fibrous strands of 0.1 µm diameter (Weber 1931; Buckner et al. 2002). The mean length of the pedicel corresponds to a 1/10th of the mean egg length (0.24 mm). The females keep stylets inserted into the leaf tissue like a pivot, feeding during oviposition and rotating around. Oviposition occurs within about 45–60 s per egg (Weber 1931; Wyss 2006). The ovipositor bent at an angle of 70–80° to the substrate. Its sharp tip penetrates the leaf epidermis by alternating movements of the paired gonapophyses (inserting into a single epidermis cell), which cause remarkably low mechanical wounding (tiny holes). The cannula-shaped tip of the unpaired gonapohyses releases the colleterial gland secretion into the hole. The egg pedicel slips into the prepared secretion-filled hole, gonapophyses retract, and elastic wound edges surround the pedicel, which is implanted up to the egg base, seldom less deep. Finally, hind legs groom the abdominal tip (Weber 1931). A female lays an average of five eggs per day, totally 130–534 eggs during its life. The number varies depending, among others, on the host plant quality (Weber 1931; Roermund and van Lenteren 1992; Lei et al. 2001). The pedicel can passively bend in narrow cells or slightly deform by certain pressure. It is guided by the ovipositor which penetrates the outer cell layer and may extend into the next cell layer (Weber 1931). The released portion of colleterial gland secretion cures and keeps the inserted pedicel firmly attached to the plant. A further effect of the colleterial gland secretion is the elastic plugging of wound margins in the leaf tissue (wound sealing). The amount and dispersion of colleterial gland secretion depend on the conditions detected by the ovipositor; mostly a circular droplet adheres to the outer leaf cell walls, obviously filling cavities and quickly curing. The whitefly colleterial gland secretion has always contact to plant cell walls but is never loosely observed in air spaces. It is certainly permeable for water and nutrients surrounding the egg pedicel and particularly fast curing as a result of the reaction between secretion and cell sap, similar to stylet sheets inside the plant tissue. The colleterial gland secretion may cause alterations in cells, such as osmotic effects. Water is osmotically attracted from plant cells, diffusing through the cell walls, the colleterial gland secretion and the pedicel into the egg, in order to keep the water content of egg at a threshold (Weber 1931; Deshpande 1936; Poinar 1965; Wigglesworth 1965; Hinton 1981; Paulson and Beardsley 1985; Byrne et al. 1990; Lei et al. 2001; Buckner et al. 2002). The vitality of whitefly eggs widely depends on the living host plant, i.e., the turgor pressure and the condition of the leaf. On living, intact leaves, eggs develop without hindrance, vice versa, on cut drying leaves eggs are damaged (Lloyd 1922; Weber 1931). Factors, such as nutrient content and water stress, have been shown to affect host plant selection by adult whiteflies (Lauritsen and Paulson 1998). Eggs increase their mass (47%, volume uptake: 0.6–0.7 nl per egg within 48 h) over time (Byrne et al. 1990; Castañé and Savé 1993; Buckner et al. 2002). They weigh about 0.4–1.1 µg and have a typical insect egg surface area-to-volume ratio of about 50 cm2 ml−1 (Hinton 1981; Buckner et al. 2002). Although exploiting a wide range of food plants, rather thick sapful leaves are among most favored hosts of T. vaporariorum. Females can discriminate between good, poor, and non-host plants by indirect and direct assessment of leaf suitability (Hassell and Southwood 1978; van Boxtel et al. 1978; van Sas et al. 1978; Dowell 1979; van Lenteren and Noldus 1990; Roermund and van Lenteren 1992). They prefer the abaxial leaf side for feeding and oviposition, which could be related to physical attributes of the epidermal cell wall (i.e., cell “toughness”), the higher number of stomata and thinner waxy layer on the abaxial leaf, as well as protection from rain, radiation and honeydew (Weber 1931; Coombe 1982; Lauritsen and Paulson 1998). Leaf age is a major factor: whiteflies favor young leaves to old ones, particularly for oviposition (Kenny 1958; Strümpel 1983; Walker 1987, 1988; Bährmann 2002). Also plant species, genotypes, and cultivars matter for host choice, oviposition, and egg survival (Hinton 1981; Roditakis 1990; van Lenteren and Noldus 1990; Castañé and Albajes 1994; Bährmann 2002; Avery et al. 2015). In contrast, plants possess multiple resistance mechanisms against the greenhouse whitefly, including antixenosis and antibiosis mechanisms (De Ponti et al. 1975; Bas et al. 1992; Castañé and Albajes 1994; Soria et al. 1996; Darshanee et al. 2017). A particular combination of external stimuli and some physical and biological factors including plant characteristics, such as plant architecture, secondary metabolites, and leaf features, such as pubescence, are commonly involved in phytophage-plant interactions which trigger oviposition (Hinton 1981; Guershon and Gerling 2001). Leaf abaxial cuticle thickness is negatively correlated, while leaf trichome density, trichome length, and leaf lamina thickness are positively correlated with the number of laid whitefly eggs (Castañé and Albajes 1994; Hasanuzzaman et al. 2016). Leaf pubescence influences the host plant selection by whiteflies: trichomes can provide a physical barrier (Duffey 1986) as well as favorable microclimate (Willmer 1986); ‘moderate’ pubescence seems to be preferable (van Lenteren and Noldus 1990). The density of trichomes is not involved in whitefly resistance (Turnipseed 1977; van Lenteren and Noldus 1990; Maliepaard et al. 1995), while the procumbent alignment of trichomes flat to the leaf surface causes lower whitefly populations (Lambert et al. 1995). Plant epicuticular wax composition and thickness of the epidermal cuticle may influence host plant acceptance (Lei et al. 2001); high levels of luteol in plant epicuticular lipids hamper whitefly colonization (Cabi 2018). However, chemical and physiological plant factors play a crucial role in the repellence of whiteflies (van der Kamp and van Lenteren 1981; Bährmann 2002). Nevertheless, the polyphagous greenhouse whitefly has a total world record of 859 plant species belonging to 469 genera in 121 families and is one of the most important global pests due to induction of phytotoxic disorder, physiological stress, sooty moulds through excreted honeydew, and the transmission of the large number of plants viruses (Quaintance and Baker 1915; Nakazawa et al. 1976; Roditakis 1990; Oana et al. 2007; Iida et al. 2009; Zhang and Wan 2012; Gamarra et al. 2016; Cabi 2018). Crop yield is severely reduced by feeding T. vaporariorum, particularly causing major economic problems in greenhouse production (Lindquist et al. 1972; Roermund and van Lenteren 1992). Their effective control by conventional chemical pesticides is becoming increasingly difficult (Tosh and Brogan 2015; McDaniel et al. 2016). Greenhouse whiteflies suggest genetic plasticity, resulting in relatively fast and simultaneous development of ecotypes on different host plants and fast developed resistance against insecticides, such as buprofezin and imidacloprid (Wardlow et al. 1972; Gorman et al. 1998; Omer et al. 1993; Ortega Arenas et al. 1998; Bährmann 2002; Iida et al. 2009; Cabi 2018). From this point of view, a detailed understanding of whitefly biology is of high significance. To test the influence of plant cultivar and leaf age on greenhouse whitefly egg attachment, we exemplarily choose four cut rose cultivars (Rosaceae) because T. vaporariorum is one of the important pests in cut rose cultivation in greenhouses. Whereas parasitoids can successfully control greenhouse whitefly populations in greenhouse vegetable production, where a low greenhouse whitefly population density can be tolerated, biological control of whiteflies in ornamentals is not fully satisfactory. Customers, quality standards, and import quarantine regulations only accept plants or cut-ware free of pests and beneficial insects. Also, combinations of biocontrol and suitable insecticides often fail to control whiteflies, which can be partly explained by increasing whitefly resistance against restrictive impacts (e.g., Cabi 2018). Since 2000, rose growers are faced with growing whitefly problems due to the declining use of broad-spectrum insecticides (Götte and Sell 2002; Raspel et al. 2006; Toscano et al. 2007; Pijnakker et al. 2007; Pijnakker and Ramakers 2009; Cabi 2018). In addition to whiteflies, cut roses must withstand a variety of pests and diseases, including, among others, insects, mites, and fungi, which have to be controlled in concert. In particular, sprayings of sulfur against frequently occurring powdery mildew are lethal to the parasitoids of whiteflies (Pijnakker and Ramakers 2009). Thus, plant features, such as physical resistance, should be addressed and included in integrated pest management (IPM) approaches to control whiteflies. The morphological characteristics and penetration resistance (force) of leaf epidermis were studied and related to the force required to pull off the eggs from leaves. We expected that a more robust plant leaf epidermis corresponds to lower egg pull-off forces because of required higher ovipositor penetration forces and thus poorly implanted egg pedicels in tougher old leaves and those of greenhouse whitefly-resistant cultivars. Four cultivars of cut rose (Rosa hybrids) were considered in the present study, possessing decreasing robustness and increasing susceptibility to herbivores and phytoparasites in the following order: ‘Schloss Ippenburg®’ > ‘Cherry Freelander®’ > ‘Poesie®’ > ‘Reggae®’ (Kiefer 2005, 2008; for detailed descriptions of cultivars see Table S1 and Fig. S1). Two-to-five-year old, bare-rooted rose plants were obtained from nurseries and grown in 10-l containers filled with Floraton 2 substrate (Floragard Vertriebs-GmbH, Oldenburg, Germany) placed on benches in a greenhouse at 23/18 °C day/night temperature, 60–70% relative humidity, and 16:8 h light:dark period (additional illumination: 30 klx, 400 m−2). The substrate was kept moist by periodically accumulating irrigation on greenhouse tables, including fertilizer 0.5% Wuxal® Super (Wilhelm Haug GmbH & Co. KG, Düsseldorf, Germany) twice per weak. Insecticides Pirimor® (pirimicarb, ADAMA Deutschland GmbH, Cologne, Germany) and Spruzit® Schädlingsfrei (pyrethrin, W. Neudorff GmbH KG, Emmerthal, Germany) against yellow rose aphids Rhodobium porosum Sanderson (Hemiptera, Aphididae) and the fungicide Bayer Garten Rosen-Pilzfrei Baymat® (tebuconazole, Bayer CropScience AG, Mohnheim am Rhein, Germany) against rose powdery mildew Podosphaera pannosa (Wallr.) de Bary (Erysiphales, Erysiphaceae) were applied as required. Predatory mites Neoseiulus cucumeris Oudemans (Acari, Phytoseiidae) were released periodically and prophylactically to control two-spotted spider mites Tetranychus urticae Koch (Acari, Tetranychidae). Yellow sticky traps allowed the monitoring of Western flower thrips Frankliniella occidentalis Pergande (Thysanoptera, Thripidae). Flower buds were manually removed. Leaf samples were obtained from rose plants at BBCH stage of about ‘52 502’, i.e., inflorescence emergence, the first inflorescence of the terminal buds burst (Meier et al. 2009). At this stage, plants exhibited up to eight main shoots of 0.5–1.2 m length. Leaves 3 days after unfolding were defined as ‘young leaves’ and about 16 days after unfolding as ‘old leaves’, corresponding to about the 4th and 10th leaf counted from the shoot apex, respectively. This choice corresponds to previous observations of the vertical within-plant movement of adult T. vaporariorum on tomato plants, where most insects, emerged in the early morning on leaves 7–9 (counted from the top), moved upwards until having reached a preferred leaf (Noldus et al. 1985). The average position stabilized at 2.5 leaves from the top of the plant. Adult whiteflies frequently established highly aggregated clumps or clusters at the final state of the cyclic process, which includes (1) feeding and oviposition by adults (underside of uppermost leaves), (2) development of immature stages (typical vertical distribution within the plant—newly emerged adults on leaves 15–16), and (3) vertical movement of adults (Noldus et al. 1985). Greenhouse whiteflies T. vaporariorum were obtained from a longtime greenhouse stock culture on Nicotiana tabacum L. ‘White Burley’ (Solanaceae), kept in 40 × 40 × 60 cm gauze cages at 25/20 ± 2 °C (day/night), 60–70% relative humidity, and 16 h photoperiod (Institute of Phytomedicine, University of Hohenheim, Germany). For the study with cut roses, a greenhouse whitefly population was separated on Rosa hybrida ‘Jockey®’ (Tantau, Uetersen, Germany) and reared under the conditions as mentioned above in a 100 × 100 × 150 cm gauze cage for about 1 year. For oviposition on test rose cultivars, females were collected from the culture on R. hybrida ‘Jockey®’ with an exhaustor and anesthetized by CO2. Then, 20 adults were transferred to ‘young’ and ‘old’ rose leaves, and kept in clip-cages (custom-modified plexiglass Petri dishes of 6 cm diameter, 1.5 cm height, with ventilating gauze openings and foam-covered edges) for 24 h.
Live adult whiteflies and eggs were fixed in 70% ethanol, and then, placed on glass object slides. After the total evaporation of ethanol, samples were submerged in a droplet of lactic acid, aligned, and covered with a cover slide. After keeping them at 60 °C for 90–300 min, samples were observed with a stereomicroscope Zeiss Stemi SV 11 Apo and a light microscope Zeiss Primo Star combined with objectives Plan-Achromat 4×/0.1, 10×/0.25, 40×/0.65 Ph2 (Carl Zeiss Microscopy GmbH, Jena, Germany). Images were taken with the digital camera Nikon D800 and processed with the softwares Nikon Capture NX-D (Nikon GmbH, Düsseldorf, Germany) and Adobe Photoshop Elements 15 (Adobe Systems Software Ireland Ltd.). The plant surface and its interface with the greenhouse whitefly eggs were visualized at high resolutions using a cryo-SEM Hitachi S-4800 (Hitachi High-Technologies Corp., Tokyo, Japan) equipped with a Gatan ALTO2500 cryo-preparation system (Gatan Inc., Abingdon, UK) as well as with cryo-SEM SUPRA 40VP-31-79 (Carl Zeiss SMT Ltd., Oberkochen, Germany) equipped with an EMITECH K250X cryo-preparation unit (Quorum Technologies Ltd., Ashford, Kent, UK). Fresh samples of 3 × 3 mm from living intercostal abaxial rose leaves covered with eggs were cut with a razor blade. Then, they were mounted on metal holders using polyvinyl alcohol Tissue-Tek OCT compound (Sakura Finetek Europe, Zoeterwoude, The Netherlands), frozen in the preparation chamber at − 140 °C, sublimed at − 70 °C to remove ice crystal artifacts, sputter-coated with gold–palladium or palladium (6 nm), and examined in a frozen state in the cryo-SEM at 5 kV accelerating voltage and − 100 °C temperature. By using a cold scalpel, fractures of frozen leaves were performed in the preparation chamber at − 140 °C to visualize cross sections of leaves. Next, samples were sublimed, sputter-coated in the frozen condition, and examined in the cryo-SEM as described above. Morphometrical analyses of plant and animal samples were carried out with cryo-SEM micrographs using SigmaScan Pro 5.0.0 software (SPSS Inc.) (Fig. S5). However, the batch of plant samples used for cryo-SEM differed from those used in force tests. Leaf penetration force experiments were carried out with the force tester Basalt 01 (Tetra GmbH, Ilmenau, Germany). It includes three main parts: a platform, a glass spring (spring constant: 42 N* m−1, the range of force resolution: 200–400 µN) with a penetration pin attached, and a fiber-optic sensor (described in detail in Scherge and Gorb 2001). The pin was a 12-mm long insect preparation minuten pins V2A made of stainless steel by Monarch company (Czech Republic). Its tip was manually beveled using polishing paper of 1-µm particle size, resulting in a pin tip diameter of 1 µm (Fig. 2i). Thus, piercing in a dimensional range of single epidermal cells was possible. Therefore, ‘young’ or ‘old’ rose leaflets were attached to the platform with double-sided adhesive tape, the abaxial side facing up. The glass spring with the pin was advanced 50 µm downwards continuously at a velocity of about 10 µm s−1, penetrating the abaxial leaf epicuticle, cuticle and epidermal cell walls, kept for 5 s at a plateau phase. Then, the pin was retracted from the leaflet at the same velocity. Force-distance curves were recorded for a leaflet at 20 sites per cultivar and per leaf age (Fig. 1a) at 24–26 °C, 40–60% relative humidity. In total, 160 single measurements were realized. To measure egg attachment to the plant surface, a 0.4-mm long, stainless steel insect pin size 3 (0.5 mm diameter, ENTO Sphinx s. r. o., Pardubice, Czech, Republic) firmly adhering to a force transducer (10 g capacity, Biopac Systems Ltd, Santa Barbara, CA, USA) combined with a motorized micromanipulator DC3314R and a controller MS314 (World Precision Instruments Inc., Sarasota, FL, USA) was used (Fig. 1b). A living, freshly cut rose leaflet with eggs perpendicularly adhering facing up on the abaxial side was attached to a holder with double-sided adhesive tape. First, the pin tip was covered with super glue Loctite (Henkel Loctite Deutschland GmbH, Munich, Germany) and gently brought into contact with the free terminal of the egg. Then, the pin with the egg was moved up with a velocity of 200 µm s−1. 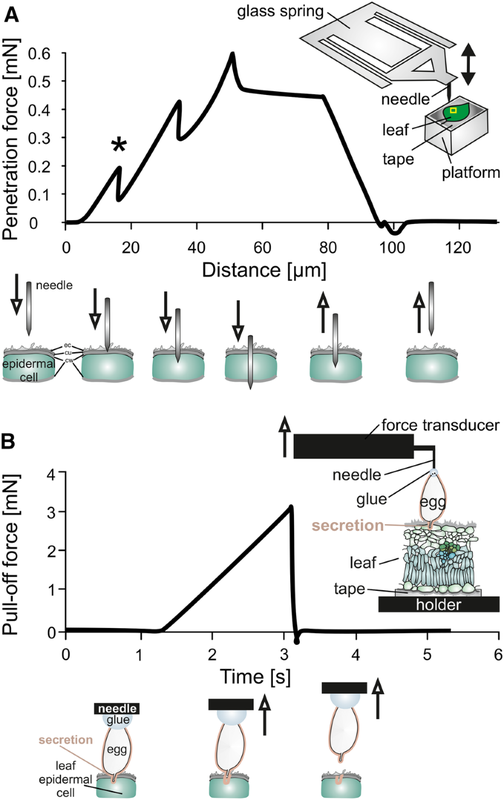 The pull-off force during the retraction of 1.5-to-3-days old eggs from the leaf epidermis was measured (Fig. 1b), recording force–time curves with Acq Knowledge 3.7.0 software (Biopac Systems, Inc., Goleta, CA, USA). The pull-off forces of 20 single eggs per each rose cultivar and leaf stage were measured at 22–24 °C and 35–45% relative humidity. In total, 160 single eggs were pulled-off. Statistical differences in pull-off force and penetration force between cultivars and leaf ages were elucidated by Mann–Whitney rank sum test and t-test, and relationships were tested by linear regressions using software SigmaPlot 12.0 (Systat GmbH, Erkrath, Germany). The R aov-function, running on R version 3.5.0 (R Core Team 2018) was used to fit a three-way ANOVA. The three single factors and all their possible combinations (i.e., ‘interaction terms’, up to three-way) were used to explain the ‘response variable’. The aov-function was used in the maximum likelihood estimation, and the error structure was distributed normally. All rose cultivars exhibited pinnate leaves, consisting of 5–7 ovate leaflets with serrated edges and reticulated venation including the main vein, secondary and lower-level veins. Leaf characteristics differed between cultivars, between young and old leaves, as well as between adaxial and abaxial leaf. Thickest leaves were found in ‘Cherry Freelander®’, thinnest ones in ‘Poesie®’ (thickness of 237 µm and 130 µm, respectively, Table S2, Figs. S3 and S4). The leaf specific area (LMA), i.e., the ratio between leaf dry mass and leaf area, highly correlates with leaf processes, such as maximum photosynthetic rate, and differed accordingly (Table S2). Old leaves were thicker than young ones (Table S2). Epidermal cells were irregularly shaped, larger and more prominent adaxially than abaxially. Abaxially, they measured 12.4–22.2 µm in height, 33.1–65.7 µm in length, and 21.6–38.7 µm in width. The leaf surface was covered with networks of 0.1–1.6 µm high and wide epicuticular crystalline wax ribbons, which occurred denser abaxially than adaxially (Table S2, Fig. S2) and rarely interspersed by crystalline wax platelets. Wax crystals arose from an amorphous crystalline, 0.1–0.4 µm high epicuticular wax layer, which superimposed the 0.1–0.7 µm high cuticle and the 0.4–1.7 µm high epidermal cell wall (Table S2, Fig. S2–S5). The outer leaf layers appeared to be thinner abaxially than adaxially and in young leaves than old ones. The ovipositor of T. vaporariorum tapered acutely. The unpaired and paired gonapophyses formed an angle of 20.3° ± 2.02° (mean ± SD, n = 3) at their tips (Fig. 2). Light microscopic images illustrated the elaborated construction of the ovipositor and the dark coloration of its components, indicating their reinforcement by sclerotization (Fig. 2a–c). The mean length of gonapophyses was 28.8 ± 2.66 µm (n = 3), their mean tip width was 0.2 ± 0.14 µm (n = 3) (Fig. 2e–g). Gonapophyses were shaped ventrally concave and dorsally convex. The concave surface was covered with anisotropically arranged, procumbent, tapered, cuticular teeth pointing distally. Transverse ridges serrated the convex outer cuticle (Fig. 2e, h). Seven tactile setae, situated at the abdominal tip, had a mean length of 30.8 ± 3.47 µm and width of 0.9 ± 0.09 µm (n = 5) (Fig. 2d). Female T. vaporariorum attached their eggs perpendicularly to the abaxial leaf surface by a pedicel plugged into the leaf epidermis (Fig. 3a, d, f). No preference for a distinct site on leaf epidermis was observed in egg positioning. The shape of eggs was elongated ovoid with one slightly flattened side towards the tip (Fig. 3b, d). The egg pedicel measured 27.9 ± 3.50 µm (n = 7) in length, 7.3 ± 0.97 µm and 2.2 ± 0.61 µm (n = 7) in width at its base and tip, respectively (Fig. 3f–k). The surface of the egg was sparsely covered with coiled wax crystals released by the whiteflies (Fig. 3e). The pedicel appeared to be hollow inside (Fig. 3b, c, k), twisted and curved when inserted in the leaf tissue (Fig. 1c, h). Cryo-SEM revealed a thin coverage with colleterial secretion over the whole egg (Fig. 3f, k). Larger amounts of secretion were found around the pedicel (Fig. 3f–k). After retracting eggs from leaves, more or fewer residues of secretion were detectable on pedicels. The transition zone, where the secretion sealed the egg pedicel with the leaf surface, always remained clearly visible (Fig. 3b, c, f–k). Highly magnified details of the secretion showed a dense meshwork of 26.8 ± 5.52 nm thin and 847.7 ± 383.84 nm long fibers embedded in a fluid matrix (n = 10) (Fig. 3l–n). The force required to penetrate the abaxial leaf epidermis ranged between mean 119.6 and 231.1 mN in young rose leaves and 189.4 and 274.5 mN in old ones (Table S3). Except for the rose cultivar ‘Schloss Ippenburg®’, forces were significantly lower in young leaves compared to old ones (Fig. 4A). Forces measured in the young leaf of ‘Schloss Ippenburg®’ differed significantly from young leaves of all other cultivars. Considering old leaves, ‘Poesie®’ and ‘Reggae®’ possessed a significantly more resistant epidermis compared to ‘Schloss Ippenburg®’ and ‘Cherry Freelander®’. Eggs detached from the leaves by applying 2.8 to 3.9 mN mean pull-off forces (Table S4). Except for the rose cultivar ‘Poesie®’ significantly higher egg pull-off forces were measured on young leaves (Fig. 4B). No statistical differences in pull-off forces between cultivars were found if separately evaluated for young and old leaves (one-way ANOVA, P > 0.05). Considering pull-off force as the dependent variable in a three-way ANOVA, rose cultivar and leaf age had a significant impact on the attachment of greenhouse whitefly eggs (Table 1). There was a statistically significant interaction between cultivar and leaf age (P = 0.02) as well as between cultivar, leaf age, and leaf penetration force (P = 0.02). However, only penetration force had no significant effect out of the three-way interaction. Our observations of greenhouse whitefly and rose leaf morphology match previous reports (e.g., Weber 1930; Byrne et al. 1990; Lauritsen and Paulson 1998; Buckner et al. 2002; Torre et al. 2003). The greenhouse whitefly egg pedicel covers about one to two-hundredths of the abaxial rose epidermis cell area. The pedicel length fits more or less the height of abaxial leaf epidermal layer, i.e., it is expected to anchor in single epidermal cells or intercellularly in between them. Our images exclusively showed internal cell fixation. Egg pedicels surrounded by colleterial gland secretion, placed in the leaf epidermis remind of technical wall plugs having high detachment moment and pull-off strength (Fig. 3; Lang 2006). Such plugs are anchoring systems usable for any substrate, relying on form closure, friction locking, and adhesive bond forming a composite material and transferring weight into the substrate, which is optimized by the shape of the shaft (Dereser 2006; Dombrowski 2006; Lang 2006; Eligehausen and Fuchs 2012). They are torque-controlled, displacement-controlled by composite plaster injection technique, forcing apart (i.e., bending the pedicel tip), also anchoring in hollow stonework (Lang 2006). Similar to technical adhesive bonds by gluing injection plugs (Dereser 2006), greenhouse whitefly pedicels slightly rotate during insertion (Fig. 3h), sharing initial jerky progress with technical plug drilling (Lang 2006; Wyss 2006). For wall plugs, 34°-tips are known to enable the precise locating of thin shafts (Lang 2006). We assume a similar precision of greenhouse whitefly ovipositor gonapophyses, which taper at an angle of 20.3°, having tip diameters of about 200 nm. Distinct detection of surface topography and texture additionally mediate 7–8 posterior tactile setae (Fig. 2d; Hinton 1981). Three longitudinally connected parts of insect ovipositor (gonapophyses) that can slide along each other result in a minimal disturbance of the substrate and limit the net pushing force during drilling gonapophyses (Cervenik et al. 2017). As in other insects (Cervenik et al. 2018), the distal region of the greenhouse whitefly ovipositor appears geometrically asymmetric with a beveled, highly acute sclerotized tip (Fig. 2). Such morphology results in decreased, asymmetric forces which simplify insertion to substrates withstanding buckling, mechanical failure, and axial load (Cervenik et al. 2018). However, the force at the needle tip increases due to deformation of the substrate, until the substrate surface or internal tissue layers are ruptured, causing the force at the tip to decrease (Cervenik et al. 2018). This is in accordance with the shape and peaks of force-distance curves, which we obtained while penetrating abaxial leaf epidermis with an insect minuten pin (Fig. 1a). For wasps, acute angles of ovipositors to the substrate surface were reported on softer substrates, while on stiffer substrates the ovipositor is held perpendicularly to the surface to avoid large lateral forces that might result in buckling (Cervenik et al. 2017). 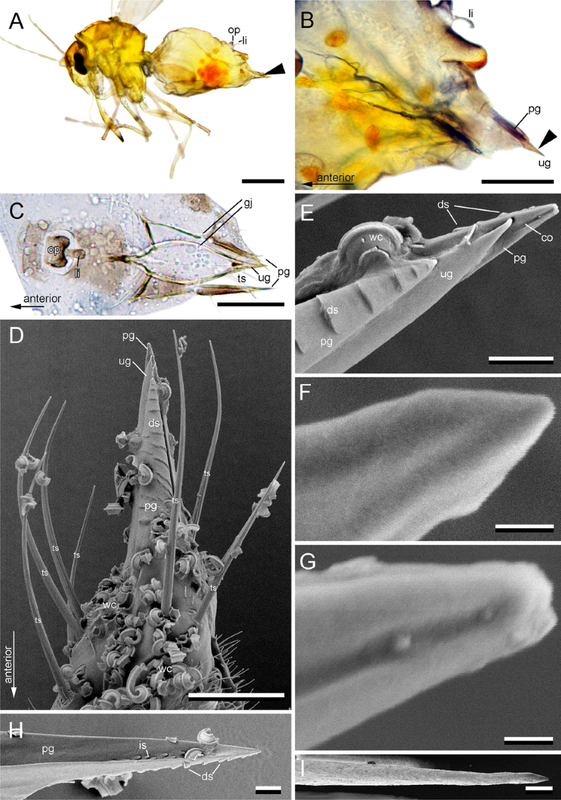 In T. vaporariorum ovipositors, angles of 45°–80° to the substrate surface were observed in previous and the present studies (Fig. 5; e.g., Bährmann 2002). Substrate density had a negative effect on insertion speed of wasp ovipositors. Thus, penetration into denser substrates is expected to be more energetically costly by increased friction between ovipositor and substrate (Cervenik et al. 2017). Because the mode of oviposition in wasps (Hymenoptera) resembles that of representatives of Hemiptera, we assume similar effects in whiteflies, which is supported by significantly negative regression between penetration force and rose leaf mass area (LMA) in our study (Fig. S6H, Supplementary Material); because high LMA corresponds to high leaf tissue robustness and density (de la Riva et al. 2016). Distally pointing cuticular teeth covering the inner surface of the gonapohyses conduct downwards slipping eggs when squeezed through the egg canal into the plant tissue (Fig. 2h). Then, substantial mechanical stress act on the inside walls of the ovipositor, which can be transferred to relatively stiff substrates (Weber 1930; Cervenik et al. 2018), while anisotropically serrations on the outer gonapohyses anchor the ovipositor tip in the substrate (Fig. 2d, e). 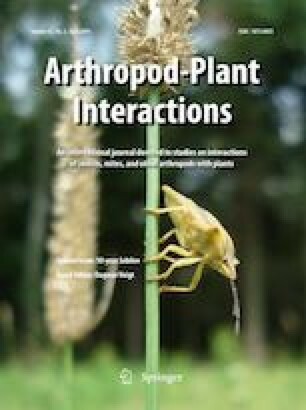 Unlike reported for other insects, we did not observe induced direct and indirect plant defenses as responses to greenhouse whitefly egg deposition, e.g., neoplasm, ovicidal substances, necrotic tissue, hypersensitive response (Fatouros et al. 2005). This observation may be explained by the low invasiveness to and physiologically interacting secretions (saliva, colleterial gland secretion) with plant tissue during both feeding and oviposition of T. vaporariorum (McDaniel et al. 2016). In contrast to, e.g., several species of beetles (Coleoptera) and sawflies (Symphyta) (Meiners and Hilker 1997; Hilker et al. 2002), whiteflies do not severely damage the leaf at the oviposition site. The egg secretion, also called cement or spumaline, released by colleterial glands (accessory glands of the female reproductive system), covers and glues insect eggs to substrates, and might have sealing and physiologically active properties. Each egg, as it passes down the distal part of the common oviduct, becomes covered with colleterial fluid (Hinton 1981). This egg-protective and -fastening colleterial gland secretion is expected to contain mainly amino acids but has not yet been chemically analyzed in whiteflies. For comparison, in cabbage butterflies Pieris brassicae L. (Lepidoptera, Pieridae) it is a viscous, hygroscopic fluid consisting of a pale yellow matrix with a larger number or granules of the same color, for which acidophilic protein and lipoid part have been confirmed (Beament and Lal 1957; Carter 1990). Proteins rich in Glycin, Serine and/or Proline, 4-hydroxyproline, heavily glycosylated proteins, but also hydrocarbons and lipids were found to be involved in insect colleterial gland secretion in representatives of Ephemeroptera, Plecoptera, Auchenorrhyncha, Heteroptera, Coleoptera, Hymenoptera, Lepidoptera, and Diptera (Li et al. 2008; reviewed by; Betz 2010). A polysaccharide-rich outer layer is known from eggs of Lepidoptera, Orthoptera, and Diptera (Hilker 1994; Hilker and Meiners 2006). Sawflies Diprion pini L. (Hymenoptera, Diprionidae) fix eggs to Pinus sylvestris L. (Pinaceae) by oviduct secretion assumed to be a peptide or protein, or composition of both (Hilker et al. 2005). Forces, required to detach greenhouse whitefly eggs from abaxial rose leaves, ranged from 1.9 mN in ‘Reggae®’ to 5.4 mN in ‘Schloss Ippenburg®’ (both young leaves), corresponding to 175–941 times the egg weight. Thus, they were lower than pull-off forces previously measured for eggs of Asparagus beetles on Asparagus cladophylls (5–35 mN; Voigt and Gorb 2010) and for apple moth eggs on apple leaves and fruits (Al Bitar et al. 2012, 2014). Considering the cylindric geometry of the pedicel, its surface area can be roughly estimated as 439 µm2. Expecting the pedicel totally inserted into the plant tissue, pull-off forces might be related to adhesive strength of 4.3–12.2 MPa, which is 12, 45 and 125 times higher than that in saturniid gum moth eggs, Asparagus beetle eggs, and apple moth eggs, respectively, (comparing the maximum values; Li et al. 2008; Voigt and Gorb 2010; Al Bitar et al. 2012, 2014). Hence, this means an outstanding safety factor and resistance to external disturbance for the attached, 0.4–1.1 µg weighing eggs of T. vaporariorum during their incubation period, which may last 2–117 days (Lloyd 1922; Hinton 1981; Buckner et al. 2002). Obviously, the combined form closure, friction locking, and adhesive bond by the composite fibrous-fluid colleterial gland secretion in pedicel-anchored greenhouse whitefly eggs, similar to wall plugs, led to a tremendously higher adhesive strength compared to purely adhesive bonds in beetles and moths. 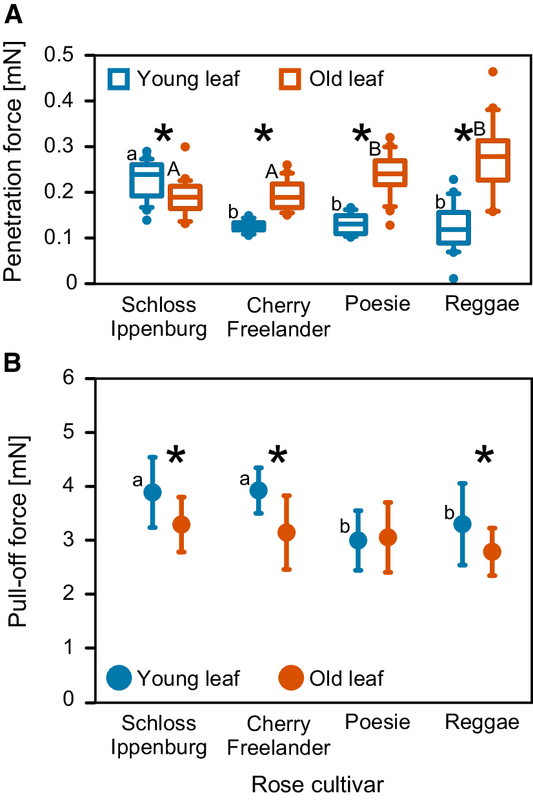 The shape of obtained force–time curves confirms the bond firmness and abrupt failure of the interconnection between greenhouse whitefly eggs and leaf epidermis. Unlike previous observations of plant tissues frequently adhering to the colleterial gland secretion that surrounded the egg pedicel, when eggs were extricated from leaves (Buckner et al. 2002), such events were only detected in 10% of tests in the present study. 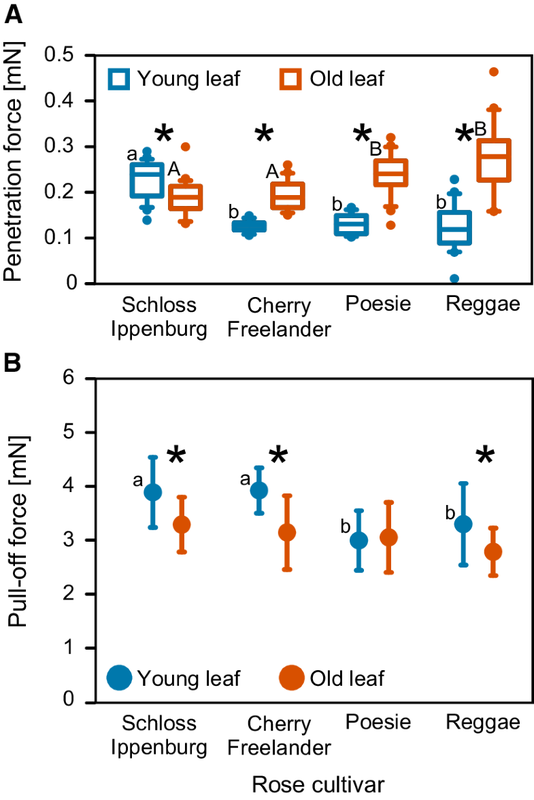 Pull-off forces of eggs differed significantly between cut rose cultivars and leaf ages, while leaf age slightly more mattered (Fig. 4A; Table 1). Leaf age effects on whitefly eggs have been previously attributed to the change in leaf protein content and chemistry during growth and senescence (Hinton 1981; Strümpel 1983). Eggs detached easier from less resistant cultivars ‘Poesie®’ and ‘Reggae®’ and old leaves. However, the penetration force of abaxial leaf epidermis only mattered if considered in interaction with cultivar and leaf age. It was lower in the less resistant cultivars. Similar cultivar-related differences in egg detachment have been previously detected in apple moths (Al Bitar et al. 2012, 2014). No significant correlation between pull-off and penetration force was detected in the present study (Fig. S6A, Supplementary Material). However, a slightly negative trend indicates that eggs were less tightly attached to tougher leaves. Probably, hardly penetrating ovipositors anchor the egg pedicels less firmly. But this aspect has to be carefully considered, because the 1 µm diameter of the piercing insect pin used in penetration tests, indicating forces of 120–275 µN required to penetrate rose leaves, much differed from the 200-nm thin ovipositor tip, and net pushing forces with which insect ovipositor gonapophyses are inserted have been previously estimated to be at the piconewton range (Cerkvenik et al. 2017). This low-force action in whitefly ovipositors is also indicated by the fast oviposition process (45–60 s per egg; Wyss 2006). Total leaf and epidermis thickness, as well as abaxial leaf surface features, were not significantly correlated with the pin penetration force and egg pull-off force. Knowing that leaf osmotic potential matters for water and nutrient uptake from plant tissue, and egg survival (Weber 1931; Strümpel 1983; Castañé 1989; Castañé and Albajes 1994), rather complex effects have to be considered at the plant-egg interface related to the anchoring of eggs. Thus, the penetration of the leaf epidermis is not only influenced by leaf surface and cell structures, but also by the counteracting cell turgor pressure. The latter measures about 0.1 MPa in a cell of the ‘bubble algae’ Valonia sp. (Cladophorales, Valoniaceae), having a 2.5 µm diameter and 0.25 µm thick cell wall. Turgor pressure causes a cell wall extension of 10–25%, resulting in tension of 50 MPa (Frey-Wyssling 1959). Plants actively accumulate sugars, amino acids, and ions, which lead to the maintenance of turgor pressure and continued plant growth (Bradford and Hsiao 1982; Morgan 1984). However, whitefly eggs have been shown to be able to hatch successfully at medium solute concentrations of 0.4–1.2 MPa (Castañé and Savé 1993), which occur in the range of regular osmotic pressures cited for most crop species without a significant history of water stress (Bradford and Hsiao 1982; Morgan 1984). High leaf glucose contents may inhibit the intake of water by eggs, causing egg desiccation (Castañé and Albajes 1994). Vice versa, a greater osmotic pressure within the egg let assume that water is absorbed into the egg against an osmotic gradient via a semipermeable vitelline membrane, i.e., the chorionic and serosal cuticle of pedicels (hydropyles) (Slifer 1938; Hinton 1961, 1981). The occurring physical pressure and a composite fluid-fibrous matrix of colleterial gland secretion surrounding the whitefly egg pedicel facilitate both diffusion processes and anchoring the egg on leaves (Weber 1930; Byrne et al. 1990; Buckner et al. 2002). Several forces act in concert during oviposition and egg attachment (Fig. 5). 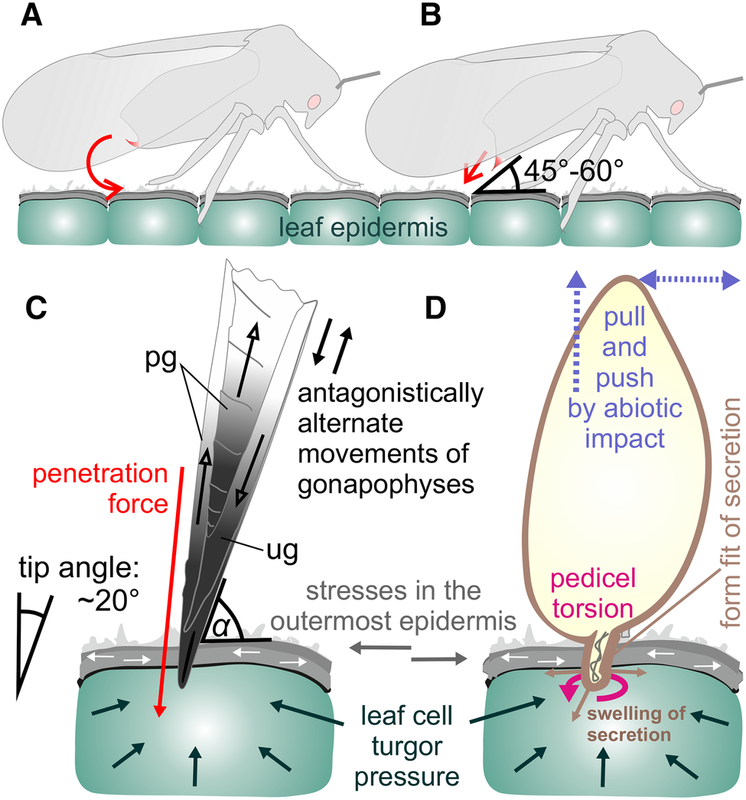 While the cell turgor pressure and cell wall tension mentioned above have to be overcome by the non-invasive ovipositor, they otherwise clamp the egg pedicel. Opposingly, the probably proteinaceous, composite fluid-fibrous colleterial gland secretion may swell (Hinton 1981), fill hollows, and exert pressure on the epidermal cell, resulting in a form closure. Pedicel rotation and deformation during insertion increase frictional interactions and interlocking with the plant substrate. Rose cultivars and leaf age impacted the penetration force of abaxial leaves and the detachment ability of greenhouse whitefly eggs from abaxial leaves. This fact is valuable for efficiently commercial rose cultivation and a comprehensive understanding of whitefly-plant interactions. A combination of various effects resulted in the reliable fixation of greenhouse whitefly eggs; turgor pressure and material tension seem to count rather than structural-textural leaf epidermal features because no distinct relations were found between measured forces and epidermis structures. Future studies considering the pressure and tension conditions of leaf epidermis and greenhouse whitefly eggs may add to the understanding of the proposed effects and the advance of greenhouse whitefly control. Sealing and shading effects of colleterial gland secretion, similar to that of greenhouse whitefly stylet sheets, are conjectured to attribute to the non-invasive plant exploitation by whiteflies. Furthermore, details of the whitefly egg anchoring mechanism can inspire the advancement of technical wall plugs for challenging substrates and conditions. Harald Schneller (Landwirtschaftliches Technologiezentrum Augustenberg LTZ, Karlsruhe, Germany; Department 3: Pflanzengesundheit, Futtermittel- und Saatgutuntersuchung, Referat 32: Pflanzenschutz—Ackerbau, Gartenbau, Biologischer Pflanzenschutz) encouraged the study and delivered preliminary observational results of greenhouse whiteflies in commercial cut rose production. Michael Reichert (Gärtnerei Reichert, Pettstadt, Germany) and Stefan Raab (Raab Rosen, Rockenberg/Oppershofen, Germany) kindly provided plant material and background knowledge of rose cultivars and breeding. Juliane Braun (consultative garden engineer, Hamburg, Germany), Fabian Gülk (Kordes Rosen, W. Kordes’ Söhne Rosenschulen GmbH & Co KG, Klein Offenseth-Sparrieshoop, Germany), and Alexander Letkow (Rosen Tantau Vertrieb GmbH & Co. KG, Uetersen, Germany) are acknowledged for valuable information about growing and breeding of cut roses. The first author thanks Michael Voigt (Zwickau/Sa., Germany) for constructive brainstorming.